Arkansas Derby 2015; Eight Sophomores Take On Hot Springs: The 79th running of the $1 million Grade I Arkansas Derby is set for this Saturday, April 11, 2015. 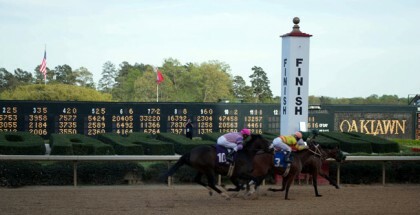 The race wraps up Oaklawn’s stakes series for three-year-olds on the Kentucky Derby trail and offers the addition of 100-40-20-10 points to the top four finishers in pursuit of a start in the 2015 Kentucky Derby on Saturday, May 2, 2015. The Arkansas Derby is run at 1-1/8 miles over the dirt, which for most of the entrants, this is the first time they will race at this distance in their careers. American Pharoah, a leading member of Bob Baffert’s “best crop of three-year-olds in years,” breaks from post position #6 with jockey Victor Espinoza in the Arkansas Derby scheduled for Saturday, April 11, 2015 at Oaklawn. The Arkansas Derby has produced five winners of the Kentucky Derby. One of the most famous is Smarty Jones who won the Kentucky Derby in 2004 after running down Lion Heart in the slop. Lil E Tee upset Arazi in 1992’s rendition of the Kentucky Derby after finishing second in the Arkansas Derby that year. One of the most successful trainers of this race is Todd Pletcher with an impressive total of four wins. Last year, year he sent in Danza who was running for the second time off a seven-month layoff and ran huge paying $41.30 on the dollar. He went on to run third in the 2014 Kentucky Derby but has since been shelved. Hopefully he’ll be back on the worktab soon. In 2013, Todd Pletcher won the Arkansas Derby with Overanalyze, who was also not the post-time favorite. The Arkansas Derby has also produced some nice second-place finishers who went on to score, one of the most notable being Victory Gallop who ended Real Quiet‘s Triple Crown bid by a nose in the 1998 Belmont Stakes. There were a number of great colts who came from the 2014 Arkansas Derby who went on to hit the board on the Triple Crown trail. Ride On Curlin placed in the Arkansas Derby and placed in the 2014 Preakness Stakes. Commissioner finished second in the 2014 Belmont Stakes after running sixth in the Arkansas Derby. Third in last year’s Arkansas Derby was the favorite Bayern, and not much needs to be said about our 2014 Breeders’ Cup Classic winner. There are four stakes races on the card, including the Oaklawn Handicap (Grade III), the PM Instant Racing Stakes, the Northern Spur Stakes, and the Arkansas Derby which is the eleventh race of the day on a card of twelve with a start time of 6:18 p.m. CST. Ultimately, the Arkansas Derby is one of the top preps for the future stars of horse racing as it sure seems to pump out a lot of nice runners. A field of eight is entered, the same number as last year’s edition. Let’s take a look at the field. Champion American Pharoah doesn’t need much of an introduction. The son of Pioneerof the Nile started 2015 with another front-running win by 6-1/4 lengths over a sealed sloppy track in the Grade II Rebel Stakes here at Oaklawn. That race marked his third consecutive victory and the first after a layoff of six months after an injury prior to the 2014 Breeders’ Cup Juvenile Race from which he was scratched. On September 27 at Santa Anita, he won the Grade l Front Runner Stakes in front-running fashion. All of his races, except his initial outing where he finished in fifth, have been won gate-to-wire. Will his connections try to rate him this time out? It sounds like he’s been tearing down the barn at Santa Anita prior to shipping and should be the one to beat. Baffert’s boy drew well here with post 6, and he already has enough points for the starting gate in the Kentucky Derby. It will be interesting to see if he can win again second off the layoff and if he’ll rate or go to the front. Far Right puzzles me. This colt has been ruling the preps at Oaklawn, but his pedigree doesn’t scream distance. Following victories in the January 19 Smarty Jones Stakes and the February 22 Southwest Stakes, trainer Ron Moquett decided to skip the Rebel Stakes and train right up to this race. He comes in having not raced in seven weeks and with only three works in 48 days, so we’ll see what he’s got. The ridgling son of Notional has 22 points, and if he can hit the top tier he should get a spot in the gate for the Kentucky Derby. He gets Mike Smith up which is a nice bonus in many people’s eyes. This horse has won from 4-1/2 furlongs to 1-1/16 miles and has been around the block at a few different tracks. He comes in off the two-win race streak and how can you not love a horse who sold for $2,500 as a yearling aiming for the Triple Crown? Madefromlucky ran a solid second to American Pharoah in the Rebel here at Oaklawn but was no match for him on the slop. He could improve off that race, or he could regress. He was within striking distance, edging closer in the final turn until American Pharoah drew off and romped. This nice son of Lookin At Lucky was running at Monmouth, shipped to Gulfstream, won a race at 1-1/16 miles, and was transferred to the Pletcher barn. After the trainer transfer, Pletcher sent him out in an entry-level allowance race at 1-1 /8 miles where he stalked and had to dig deep before edging away to a 1-1/4 length victory over a game Quimet. This will be his third race for Todd Pletcher. He has drawn a nice post position in the 4-hole, sitting just outside Bridget’s Big Luvy who has shown speed. He has already won at this distance, but can he turn the tables on American Pharoah on a hopefully dry track? He has 20 points and needs to add to that, so hitting one of the top four slots should do it. The D. Wayne Lukas charge Mr. Z came to Oaklawn as a leading Kentucky Derby candidate but finished third in both the Smarty Jones Stakes and Southwest Stakes before the Louisiana Derby debacle in which he was sent off at 3-1 odds and pretty much stopped running, finishing in ninth. It looks like the blinkers-off experiment didn’t help, so they are coming on again in this race. The son of Malibu Moon wore them in his previous five starts which include close finishes in the Los Alamitos Futurity, running third to Dortmund and Firing Line, as well as the Delta Jackpot where he was second to Ocho Ocho Ocho. This is another horse that I have really liked in the past, but I have huge question marks here. However, in my opinion he could very easily land in the top three spots. If he runs his race, he could be tough here. Calvin “Bo-Rail” Borel stays up on The Truth Or Else who drew the rail again as he did in the Rebel Stakes where he finished in fourth place. Apparently, he didn’t like the slop either. Prior to that race he was second to Far Right in the Grade III Southwest Stakes where he made a big move five-wide before being out-finished in the stretch. His maiden win, out of nine races, came at a mile at Belmont for this son of Yes It’s True from the Ken McPeek Barn. I’ve seen quite a few people still on his bandwagon, and he should have some juicy odds come post time. The Truth Or Else will have blinkers added, so that is a plus in my book, and the colt looks dangerous here after recently firing a :58.4 bullet five furlongs. Watch out for a possible bounce-back performance. Running a distant third in the Rebel stakes, Bold Conquest is hoping to rebound Saturday. He’s only been off the board once in six races, coming in fourth on this track in the Southwest Stakes behind Far Right and The Truth Or Else. He raced closely to the pace in the Rebel which isn’t his usual style. 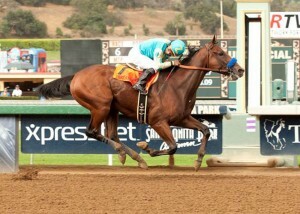 If he takes further back off the pace as he did in the Southwest Stakes, maybe he’ll have a better shot. He has 17 points, and he’ll likely need to finish in the top three to move up. His trainer Steve Asmussen is 23% third off the layoff, so he looks to improve with hot jockey Santana Jr. up again. We do have some speed signed on in Bridget’s Big Luvy who ships in from Maryland for trainer Jeremiah Englehart. The son of Tiz Wonderful is the only horse in this race in addition to Madefromlucky who has won at this distance of 1-1/8 miles in his most recent start in the Private Terms Stakes on March 21. He broke his maiden going six furlongs on the dirt in a race originally scheduled for the turf at Belmont last October. He’s fast, which might help the closers a bit if they decide to send American Pharoah on the lead. He needs to hit the top two spots to contend for a spot in the Kentucky Derby. Last but not least, we have the two-race maiden Win the Space shipping in from Santa Anita for trainer George Papaprodromou with rider Kent Desormeaux. He was third in both of his races after breaking a bit slow both times. The blinkers are coming off this horse who will be exiting outside post position 8 plus George is a 20% trainer for shipping. The son of Pulpit is a half-brother to House Rules, and his distaff pedigree is full of stamina, but he still looks outclassed. He did garner himself a nice speed figure of 95 in his second race and we’ll see what running style he employs in his first time routing. He will offer some value for those willing to take a shot in the bottom of trifectas or superfectas. The 2015 Arkansas Derby will be the first meeting between top two contenders American Pharoah and Far Right. At least there is some speed signed on with Bridget’s Big Luvy which again, may help the closers a bit. I think the Rebel Stakes helped the speed on the sloppy track which makes the margin of victory a little exaggerated as it’s harder for closers to dig in. If they send American Pharoah and no one tries to pressure him upfront, they’ll be watching each other and simply aiming for points. I’m siding with Madefromlucky again as I think this race will be a better barometer of his ability. I’m going to play Madefromlucky the same as I did in the Rebel Stakes with a ladder on him, win/place/show if he stays up 6-1 or higher. Otherwise, it’ll be just a watch race for me. I hope this year it’s a fun and exciting race like last years edition. Best of luck to the horses and their connections. Fun Fact: Of the three times Bob Baffert has won the Kentucky Derby, his horses went on to win the Preakness but lost in the Belmont. 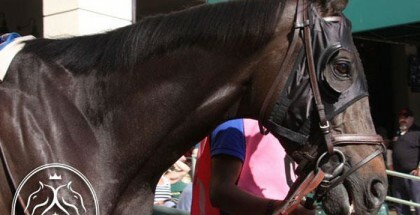 War Emblem was eighth in the Belmont, while Real Quiet and Silver Charm finished second in the Belmont. Can Baffert pull off the ultimate hat trick of winning all three races in the Triple Crown this year? I wouldn’t be surprised, but I won’t be holding my breath.